Each sconce is marked “TRF” twice and “516” once. (Probably for “Trianon République Française” and the number from a 19th century inventory. There was a sale by the French state of objects and furniture from several palaces at the end of the nineteenth century.) 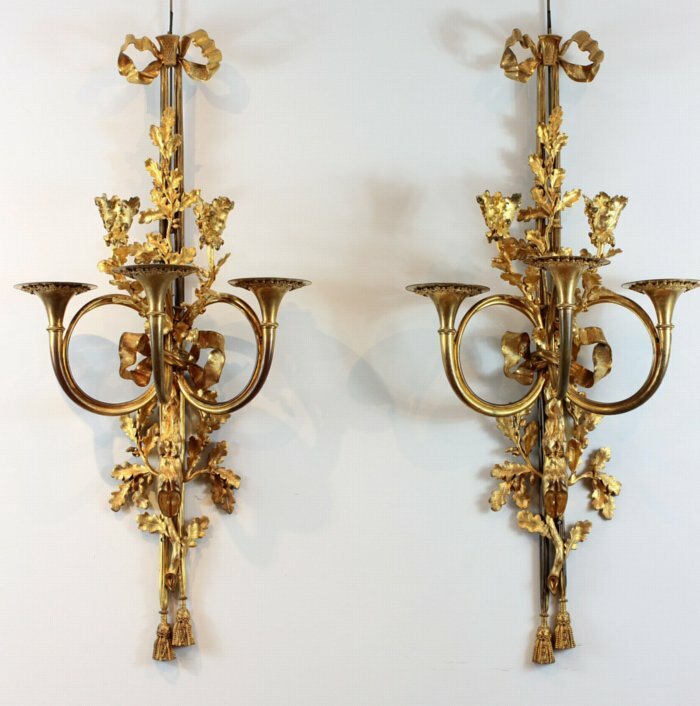 A set of four wall-lights of this model, originally for the Grand Salon of the Petit Trianon, was delivered to Versailles by Claude Galle (possibly acting as a reseller) on December 23, 1809 for 2960 francs. They are illustrated on page 98 of Le Petit Trianon by Denise Ledoux-Lebard (Les Éditions de l’Amateur, Paris, 1989) and differ only in the form of the two smaller arms between the hunting horns. They share with this pair the unusual feature of a mount decorated with vine leaves applied to the underside of the three front candle nozzles. In the Trianon book, the sconces are numbered “M.V. inv. T514”, two digits away from the number on this pair. (The numbers are probably from the inventory taken in 1839.) They are currently hung in the Salle à manger des retours de chasse in the Appartement intérieur du Roi in the Château of Versailles.